Q1. Working efficiency of A is 3 times that of B and therefore is able to finish a job in 30 days less than B. How many days will they take to finish the job working together? Q2. Three pipes A, B and C are connected to a tank. A and B together can fill the tank in 10 hours, B and C together in 15 hours and C and A together in 12 hrs. In how much time will pipe fill the tank together ? Q3. One fill pipe A is 3 times faster than second fill pipe B and takes 32 minutes less than the fill pipe B. When will the cistern be full if both pipes are opened together? Q4. There are 6 filling pipes each capable of filling a cistern alone in 16 minutes and 4 emptying pipes each capable of emptying a cistern alone in 20 minutes. All pipes are opened together and as a result, tank fills 28 litres of water per minute. Find the capacity of the tank. Q5. 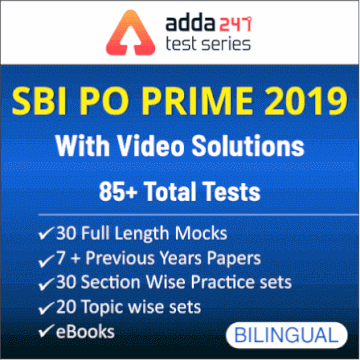 Bharat and Priyanka can do a piece of work in 45 and 40 days respectively. They began the work together, but Bharat leaves after some days and Priyanka finished the remaining work in 23 days. After how many days did Bharat leave? Q6. Ramesh is twice as good a workman as Sunil and Finishes a piece of work in 3 hours less than Sunil. In how many hours they together could finish the half of the work? Q7. A cistern can be filled by two pipes filling separately in 12 and 16 minutes respectively. Both pipes are opened together for a certain time but being clogged, only 7/8 of full quantity of water flows through the former and only 5/6 through the latter pipe. The obstructions, however suddenly removed after which the cistern was filled in 3 minutes from that moment. For how long the pipes were clogged? Q8. A and B can do a piece of work in 30 days and 45 days respectively. They start working together. After working three days A leaves and another person C joins to B. 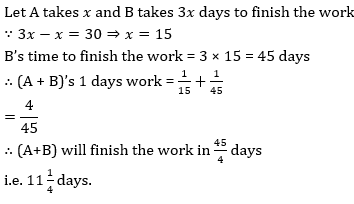 If B and C both finish the rest of work in 25/2 days then in how many days C can finish the work alone? Q9. A man can complete a piece of work in 2 days. 4 women can complete the same piece of work in 4 days whereas 5 children can complete the same piece of work in 4 days. If 2 men, 4 women and 10 children work together, in how many days can the work be completed ? Q11. A certain number of people were supposed to complete a work in 24 days. The work, however, took 32 days, since 9 people were absent throughout. How many people were supposed to be working originally? Directions (12-15): Find the value of the (?) in the following problems. Q12. 454.58 - 376.89 + 121.45 - 95.42 = ? Q15. (7.9% of 134) – (3.4% of 79) =?